Janice Y. K. Lee was born and raised in Hong Kong and graduated from Harvard College. A former features editor at Elle and Mirabella magazines, she currently lives in Hong Kong with her husband and children. "Riveting . . . This season's Atonement." "Evocative, poignant, and skillfully crafted, The Piano Teacher is more than an epic tale of war and a tangled, tortured love story. It is the kind of novel one consumes in great, greedy gulps, pausing (grudgingly) only when absolutely necessary. . . . If we measure the skill of a fiction writer by her ability to create characters and atmosphere so effortlessly real, so alive on the page, that the reader feels a sense of participatory anxiety—as if the act of reading gives one the power to somehow influence the outcome of purely imaginary events—then Lee should be counted among the very best in recent memory." "A shattering, immensely satisfying debut." "War, love, betrayal—an exquisite fugue of a first novel . . . intensely readable." "Lee unfolds the story with the brisk grace and discretion of the society she describes." "The novel is sustained by elegant prose and a terrific sense of place. As Graham Greene evoked Vietnam in The Quiet American, Lee, born and raised in Hong Kong long after the war, captures the city as it was during World War II, its glittering veneer barely masking the panic and corruption beneath." "Lee tells two engrossing love stories. . . . Just hide your phone before cracking this one open—or risk calling your ex." "Lee delivers a standout debut [with] layers of intrigue and more than a few unexpected twists." "A lush examination of East-West relations." "A rare and exquisite story. It does exactly what a great novel should do—transports you out of time, out of place, into a world you can feel in your very own skin." "One of the most insightful, elegant, and atmospheric novels I’ve read in a long time. Janice Lee is nothing short of brilliant and her novel is impossible to put down." 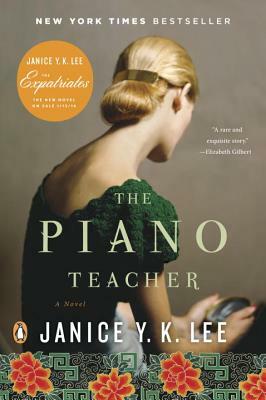 "Rarely does one encounter a debut work as beguiling and assured as Janice Lee’s The Piano Teacher. Rich with intrigue, romance, and betrayal, this wonderfully written, utterly captivating novel dazzles with its sharp-eyed renderings of beau monde Hong Kong as it is plunged into the crucible of war. With its fascinating interplay of East and West and wide cast of effervescent characters . . . this is a truly transporting—and indeed irresistible—work of fiction." Why does Claire steal from the Chens? Why does she stop doing it? Part of Claire's attraction to Will is that he allows her to be someone different than she had always been. Have you ever been drawn to a person or a situation because it offered you the opportunity to reinvent yourself? Trudy was initially drawn to Will because of his quiet equanimity and Will to Claire because of her innocence. Yet those are precisely the qualities each loses in the course of their love affairs. What does this say about the nature of these relationships? Would Will have been attracted to a woman like Claire before Trudy? What is the irony behind Claire's adoration of the young Princess Elizabeth? Were Dominick and Trudy guilty of collaboration, or were they simply trying to survive? Do their circumstances absolve them of their actions? Mary, Tobias's mother, and one of Will's fellow prisoners in Stanley, does not take advantage of her job in the kitchen to steal more food for her son. Yet she prostitutes herself to preserve him. Is Tobias's physical survival worth the psychological damage she's inflicting? Did Trudy give her emerald ring and Locket to Melody? How much did Melody really know? How do Ned Young's experiences parallel Trudy's? Did Will fail Trudy? Was his decision to remain in Stanley rather than be with her on the outside—as he believes—an act of cowardice? Would Locket be better off knowing the truth about her parentage? What would happen if Trudy somehow survived and came back to Will? Could they find happiness together?